The Leatherman® RAPTOR™ features the necessary tools for uniformed professionals to safely and quickly go to work in an emergency situation. Developed with the input of special operations medics, EMT's, and fire professionals, the Raptor has just the right balance of multipurpose features for medical-specific ops without an overkill of tools to complicate sometimes life-threatening situations. When it's a question of survival, the Raptor answers loud and clear. A thermoplastic material where strength is improved by adding chopped, glass fibers. This allows for excellent durability without adding significant weight. In Leatherman knives, the glass-filled nylon handles are so strong that an inner steel frame is not required, thereby reducing weight for a lighter every day carry. Leatherman uses a 60% glass mix. One of the hardest materials in the world outside of diamond, tungsten carbide is used as a tool to effectively and safely break auto glass and is available on Leatherman first responder tool. The tool is wonderful. It will cut things that other shears won't touch. It is the tool of choice for rescue, Nurses and ER Doctors where I live. However, the sheath is abysmal. It is nearly impossible to extract the device when it is opened and very snug when it is closed. It will not fit on a 2 1/4 inch duty belt. The tool holder portion is held on to the belt part with one screw. That screw backed out on my first night carrying it and I almost lost the Raptor. I had to buy an after market leather sheath. The Leatherman Raptor Scissors are heavy duty enough to handle cutting through any material you might run into. The extra features are just a bonus to have literally in-hand and the compactness and ease of deployment makes this a pair of trauma scissors that will last the test of time. Well worth the initial expense. i received the item in no time, and in great condition with no defects. Works perfect. I'm not EMT just a CERT team member and I wanted to take advantage of the Raptor/Tourniquet special. After opening the Raptor shears I knew they were a great example of Leatherman quality and design but when I removed my old medical shears I really understood how much better these were. The kydex sheath allows many attachment options and the folding design keeps things from being bulky. Great addition to my TCCC kit. Tool is heavy, and heavy duty. Hope I never need it, but if I do I’m confident in its utility. The Leatherman RAPTOR is a great pair of medical shears. Compact and durable. A must for your EDC. 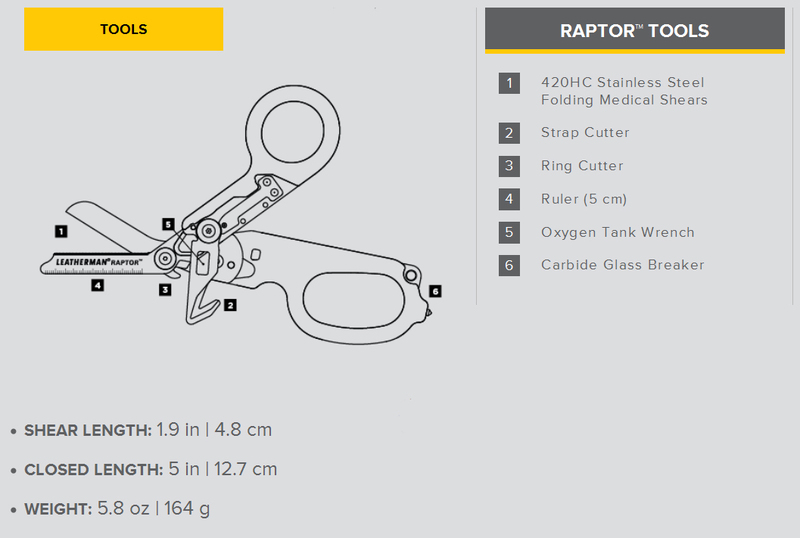 The Leatherman Raptor is extremely well made and exceeds my expectations. This product is amazing. Talk about a very nice pair of shears that are durable and very trustable. Ive used these in traumas, trips, vacations and everything in-between. These cut through boots like butter and have everything you'll need for a pair of shears to cut down on crappy tools that are just excess in your pockets. My whole ER team loves them and is often asking me to use mine. I got tired of dull trauma shears and decided to spring for the best since I use them daily in my rescue job. Quality is amazing and thanks to Rescue-Essentials I found them with the Orange handle when I could not at other online distributors. Don't hesitate to buy them; you won't regret this purchase!